Replacing one or more lost teeth offers a number of benefits for your immediate and long-term oral health. For instance, rebuilding your smile restores its youthful appearance, as well as restoring its balance and ability to function properly. With dental implants, these benefits are even more profound thanks to their ability to replace your missing teeth roots. 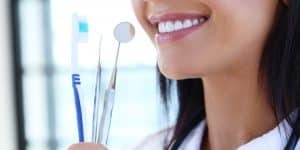 To enjoy these benefits, your dentist will first have to help you determine if you’re a good candidate for dental implants, or whether or not you may need other dental treatment first. A dental implant describes a small, biocompatible, root-like post that is inserted into your jawbone where your tooth root once rested. The purpose of the implant post is two-fold; to offer lifelike support for your dental prosthesis (such as a dental crown or bridge) and to stimulate your jawbone to keep it strong and healthy. To be successful, your jawbone, periodontal tissues, and healthy teeth must be free of disease and strong enough to support the implant posts. Therefore, your dentist will thoroughly examine the state of your oral health before recommending implants. Many patients lose teeth due to severe periodontal disease, which erodes your gums and jawbone until they can no longer support all of your teeth. The same destruction can also make it impossible for your dentist to place an implant post and secure your replacement tooth to it. If you have gum disease, then the first step to restoring your smile will need to be controlling the disease with periodontal treatment. If your jawbone has weakened, then you might require a bone graft to build it back up enough to support your implant. Recovering from tooth loss is easier and more successful with the help of one or more dental implants. To find out if you qualify for implants, schedule an appointment with your dentist by calling Keelan Dental in Butler, PA, at (724) 285-4153. Our Smile Certified experts happily serve patients from Butler, Cranberry Township, Mars, Pittsburgh, Butler County, and all surrounding communities.